Microsoft has launched the Surface Go. This is a 10-inch tablet with optional keyboard cover and stylus and it costs from $399. We saw the first reports regarding this new entry level product joining the Surface line back in May. It looks like those rumours were spot on in many regards. Yesterday more rumours and details emerged which have prompted Microsoft to reveal its hand early. Microsoft once had a similar entry level 10-inch tablet, the Surface 3, but the new one is more powerful and cheaper (the Surface 3 launched at $499). Considering the physical form of the Surface Go first, it is headlined as being the smallest and lightest Surface yet. The Surface Go is just just 8.3mm thick and weighs 520g sans keyboard and stylus (optional extras). The entry level Surface is built around a PixelSense Display that supports Surface Pen with 4096 levels of pressure sensitivity, low pen parallax, low latency, and good precision. Microsoft selected a 3:2 aspect ratio display with a resolution of 1800x1200. Microsoft Panos Panay, says this is ideal for reading books in portrait or landscape. 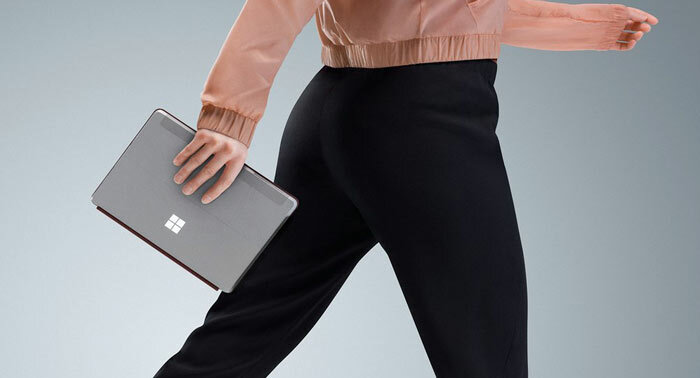 The built-in kickstand is the full friction hinge seen on modern Surface Pro tablets, and it extends to 165 degrees. 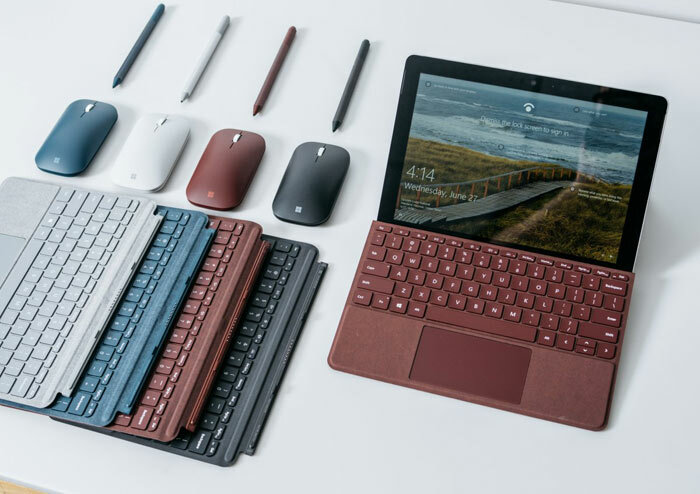 A specially designed Surface Go Signature Type Cover is said to offer ergonomic key pitch and exceptional key travel - alongside a Windows Precision Trackpad that supports five-point multi-finger gestures. Inside the fanless Surface Go you will find a 7th Generation Intel Pentium Gold Processor 4415Y. This is a 2C/4T processor, launched a year back, that offers a 1.6GHz base frequency and comes with a 6W TDP. The processor includes Intel HD Graphics 615 with 300/750MHz base/boost. Microsoft says its hardware choices deliver a battery life of up to 9 hours. On a portable the port choice is crucial and Microsoft has provided USB-C 3.1 for data, video, and charging; a headphone jack; and a MicroSD card reader - as well as the Surface Connect for charging and docking. 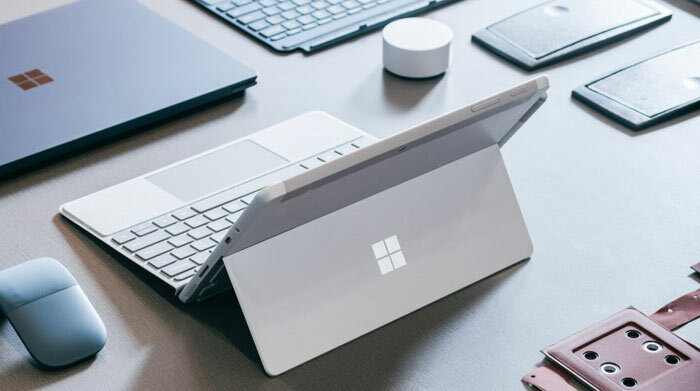 If you are interested in purchasing a Surface Go (Wi-Fi only version), Microsoft says that these machines will be available for pre-order today in many western countries, with stock on shelves from 2nd August. There will be configurations with 4GB RAM / 64GB storage at $399, and 8GB RAM / 128GB storage at $549 (I'm not sure if the storage is eMMC or SSD). The existing Surface Pen works with this device and you can opt for the Type Cover at $99 or a Signature Type Cover at $129.99. A new Surface Mobile Mouse is on the way too, but I don't have pricing for that at the time of writing. Microsoft will launch an LTE version of the Surface Go later this year. Might be interested in the LTE version, not bad! Will be interesting to see how powerful this actually is. The surface dock we already use in my firm, and something like this could be great for the sales people as their only machine. Thinking exactly the same here - at £500 (as a type cover is pretty much mandatory) it's the same price as the rather bong standard HP laptops we buy for them at the moment - despite the drop in screen size from 11“ to 10” this could be a great option…assuming the CPU is up to it and that the same high quality finish transitions from the “main” surface linen to these cheaper ones. I doubt they will have Hello for logon, and the keyboards are normally awful. The other thing is if the rumours that the 8gb RAM version has NVM SSD rather than EMM.